Sergio Aguero‘s hat-trick against Chelsea sees him become Manchester City‘s all-time record league goalscorer. The record had been held by Eric Brook since1940, who had 158 goals to his name, but the Argentine equaled and then broke that record in an incredible attacking display at the Etihad Stadium. 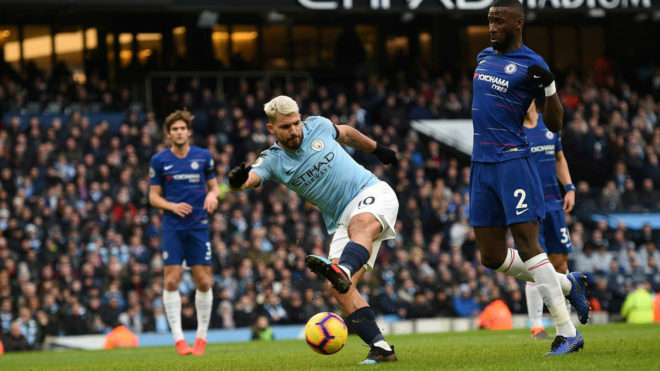 Aguero started the game by missing an open goal but made up for it with a fine long-range effort before a close range volley handed him another City record, while a second-half penalty gave him his hat-trick. In all competitions, Aguero already holds the record for the most goals in City‘s history with 222 goals since his arrival from Atletico Madrid in 2011, while Brook managed 177. His treble also equals Alan Shearer‘s record of eleven Premier League career hat-tricks with his third of the current season. Additionally, he is now the highest scoring player against Chelsea (10), surprassing Shearer (Blackburn and Newcastle) and Thierry Henry (Arsenal).